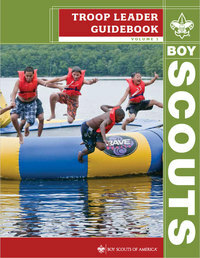 The first of two volumes of the long-awaited Troop Leader Guidebook is finally available through the BSA Supply Division’s ScoutStuff.org website and at many Scout Shops in local councils. The Guidebook, priced at $12.99, replaces the Scoutmaster Handbook and is a wide-ranging manual that explains Boy Scouting to an audience that includes not only the Scoutmaster but committee members and parents as well. It is written without jargon and assumes that the reader has little or no familiarity with the Boy Scout program. There’s a great article today on Scouting Magazine’s blog that describes the Guidebook in detail. The book is likely to be in great demand initially, so before heading to your Scout Shop, call ahead to make sure they have copies.